Happy Friday, and what a week it has been! I think we are all ready for the weekend at this point. And maybe some wine to go along with it. I know I will be spending some time celebrating this weekend, after getting our first One Room Challenge under our belts. We’re also in for our first freeze of the season, so it’ll be a great weekend for snuggling with loved ones, watching movies, or reading a book. If you like to start out your day with coffee and internet, I’ve got some links worth looking at with this week’s seen, heard, and tasted. Please remember to pin from the original source. Seen: I have been absolutely in awe over all of the incredible talent on display at the One Room Challenge link up and all of the designer posts as well. 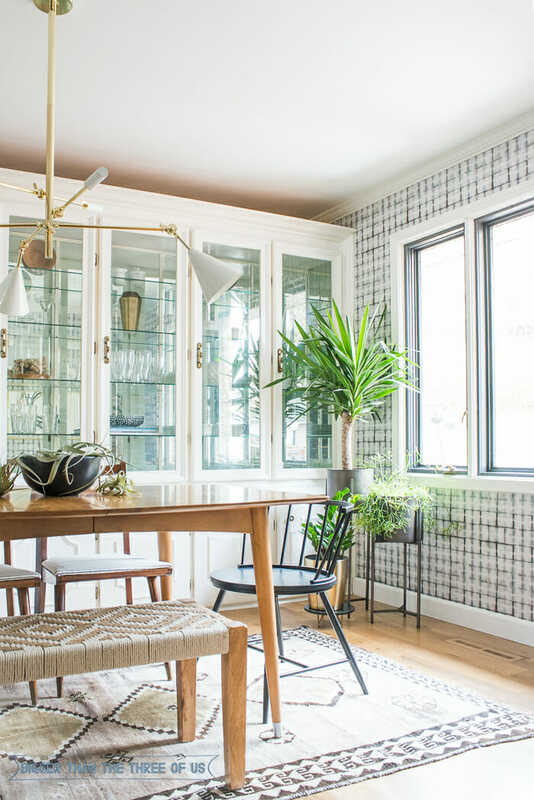 One in particular that caught my eye was Ashley’s dining room makeover. Let this picture speak for itself, but go visit to really soak it all in! Heard: I heard “Say You Won’t Let Go” from James Arthur on satellite radio the other day and fell in love. For where I am in my life, it just sang to the very heart of me. I am going to get a little emotional here for a moment…. The song opens up with these words, “I met you in the dark, you lit me up. You made me feel as though I was enough.” If you’ve been following my blog for a long time, you might know this part of my story already, and it’s definitely something that’s been on my mind a lot this year with different media events. But Arthur’s words reminded me of my own relationship with Chris because he met me when I was in the dark and at the lowest of my low times, but he made me feel like a normal person again; and I started to feel more like “me” again… a new me, but still very much me. We’ve been together now for 16 years, married for 13, and have two fantastic kids, three rescue dogs we adore, a cozy home of our own on a hill complete with chickens, of course. We’ve created a beautiful life for ourselves, but we are far from perfect. Sometimes we snap at each other in our exhaustion; some weeks we seem to be ships passing in the night. But we’ve also done so much growing up and learning together, and I know that there is no one else in this world that I want to continue to grow old with. He doesn’t read my blog at all, so this is just me taking a moment to appreciate what I have and share it with you. I hope you love this song as much as I do. Tasted: I don’t know about you, but I find healthy snacks to be a challenge and end up eating way too much fruit and too many nuts for my own good. I picked up Figgy Pops in apple cinnamon a few weeks ago and they have become my go to snack. I found mine at Costco, FYI. They are delicious and healthy, and sort of feel like a sweet treat. Have a beautiful weekend! Snuggle up with the ones you love and take a moment to let them know what they mean to you. We can all use a little kindness. I only just read your story. It is inspiring that you had the courage to write it. As the mother of two girls, this is my greatest fear for them when they go away to college in only a few short years. The more that women share, the more empowered we will be. This is what will stop it from happening to the next generation. Hugs and a huge thanks. exactly- i truly hope i can raise a strong girl, who is willing to stand up for what’s right and who is strong; and i hope i can raise a boy who also stands up for what is right, and who respects the women in his life. Heartbroken over your story yet amazed at the beautiful, strong, loving woman (Mom/Wife) that you are today. Perfect song (I had never heard it before and it’s beautiful!) – I had to relisten to it after reading the older blog post. Have a lovely weekend dear friend. thank you so much, ashley- i just love that song. Oh, and thank you for sharing my dining room! So happy to hear that you love it. isn’t it just the loveliest!